If you run your own business, it’s vital to keep accurate financial records. However, you shouldn’t see bookkeeping as a chore, but rather an opportunity to measure the fiscal health of your company. Up-to-date books can also help you convince lenders to part with their money should you need a quick cash injection. Depending on your business type, you’ll have different levels of involvement in the bookkeeping process. Sole traders must keep records of their business’s sales and expenses, while limited companies must retain yearly records for six years. As it can be a confusing process, accounting software specialist Sage has compiled its top tips for keeping tabs on income and expenditure in small businesses. Managing your cash flow manually by entering your income and expenditure into spreadsheets can be a good way to keep track when your business is small. However, electronic accounting software can pull transaction records from your bank account, so making use of it can save time, money and help avoid human error. Professional bookkeeping software can also create reports to summarise the data in various useful forms. Additionally, it can highlight areas where you’re spending too much, as well as helping predict where your business is going. It pays to set aside time to manage your books on a regular basis. If you decide to sort your accounts but find yourself struggling to keep on top of them, it’s always better to ask for support than try to fix it yourself as this can lead to problems further down the line. The best method is to do a little everyday to ensure that you stay up to date. 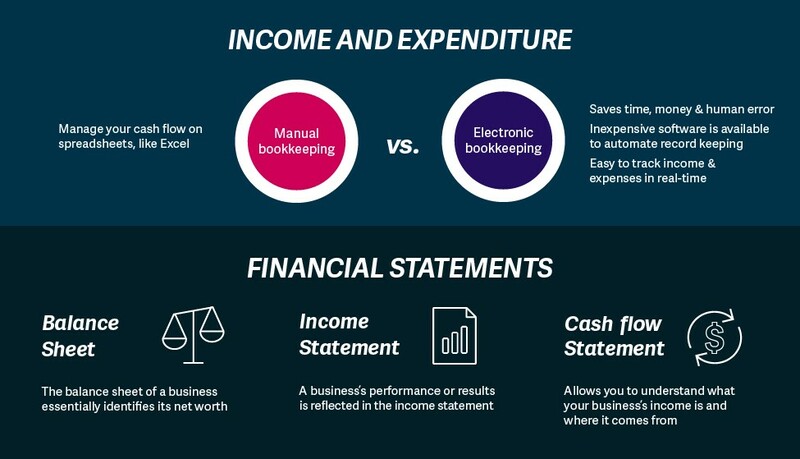 When you first start trying to untangle your company’s income and expenditure, the most important financial statements to understand are the balance sheet, income statement and cash flow statement. A balance statement gives a snapshot of a company's net worth at the end of a certain date. It’s broken down into what a company owns (assets) and what it owes (liabilities). Assets include: cash, accounts receivable, inventory, prepaid insurance, investments, land, buildings, equipment, and goodwill. Liabilities include: notes or loans payable, accounts payable, salaries and wages payable and interest payable. An income statement is an indication of the company’s performance or results over a certain period of time. This can be used to monitor when a business makes a profit or a loss. Profitability can affect whether lenders will lend to you, so keeping your books up to date will help you make a stronger case if you need additional funds. The income statement tends to be split into two sections: operating and non-operating. Operating items are the revenues and expenses involved with production, importing and selling. For example, the operating activities of a retailer include purchasing goods and selling them. For manufacturers, it would be the manufacture of products and the sale of them. Non-operating items are the revenues and expenses that are not part of the company’s regular operations. This includes interest, rent on spare property or lawsuit settlements. Small business owners need to be particularly careful about managing cash flow as they’re less likely to have enough capital to cover the daily expenses of their business. An accurate cash flow statement also allows your company to scrutinise every item you buy and get the best value for your money. Remember that some costs are also tax deductible for self-employed people, so always check the government guidelines for qualifying products. A cash flow statement also allows you to forecast points when your company is likely to have peaks and valleys in its cash flow. A negative cash flow isn’t necessarily a bad sign, especially if you’ve just invested in growth. However, a regular look at this statement will help you spot any warning signs that your business isn’t performing well. To avoid surprises, it’s always better to err on the side of caution when forecasting rather than being too optimistic. Book your place on our business planning and finance workshop today to access all the advice and support you need to succeed. You're ready for the next step! Speak to one of our expert business advisors about how we can work with you to help you grow your business and employ new staff. Are you planning for business growth? Work with our specialists to develop an effective growth management strategy to take your business to the next stage.